The International Conference of Molluscan Shellfish Safety (ICMSS) is the principal shellfish safety event worldwide for industry, government regulators and researchers to share knowledge and experience on shellfish safety issues. 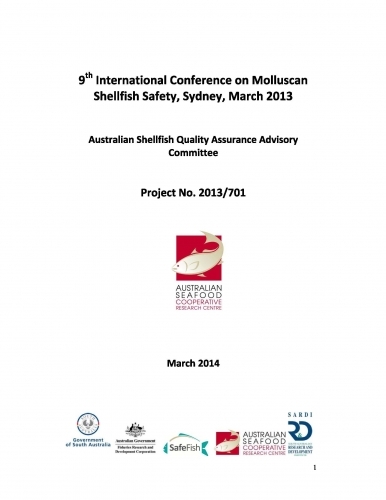 Australian Shellfish Quality Assurance Advisory Committee (ASQAAC) won a bid in June 2009 at ICMSS, France to return the 9th ICMSS Conference to Sydney, Australia where it was initiated in 1994. ASQAAC aimed to deliver a ‘cutting edge’ programme focused on shellfish safety and related disciplines and encouraged participation from a broad range of national and international experts and students. The conference aimed to assist the industry to respond to, and take advantage of, increased demand for seafood. Continued delivery of a quality product requires the industry to responsibly address latest shellfish safety information in the context of the Australian production environment. Hosting the ICMSS conference in Australia has improved the knowledge base and general understanding of food safety issues related to shellfish. This will assist the ASQAAC in its endeavours to reduce the public health risks associated with contamination of shellfish. It has also assisted ASQAAC to ensure that its current policies for managing food safety risks are appropriate for 2014, and to incorporate current international trends and innovation into shellfish safety standards in Australia. The conference also provided an important platform from which to promote the Australian perspective on shellfish risk management and international harmonisation of standards, and a unique opportunity to highlight the healthy marine environment in Australia, the safety of Australian seafood products and promote the shellfish sector.